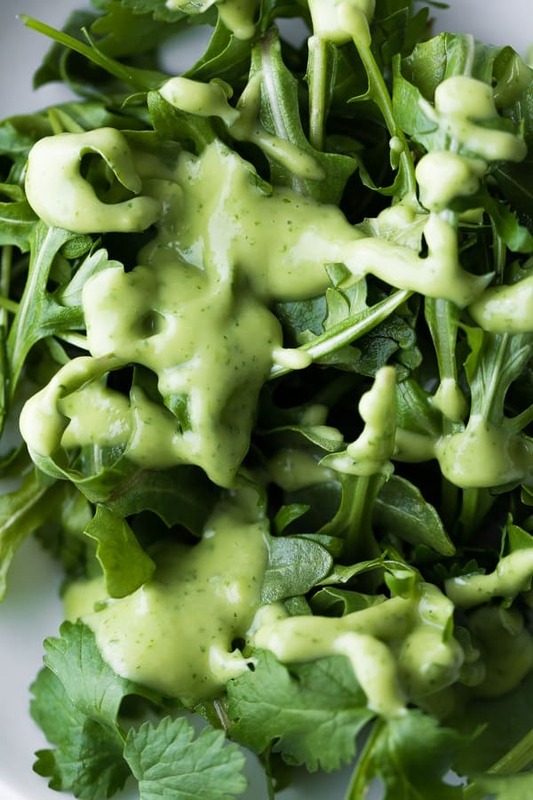 Creamy cilantro lime dressing is perfect to jazz up your salad. Fresh cilantro, avocado, garlic and lime make this so much better than store-bought! Vegan, gluten-free and paleo, plus a video to show you just how to make it. 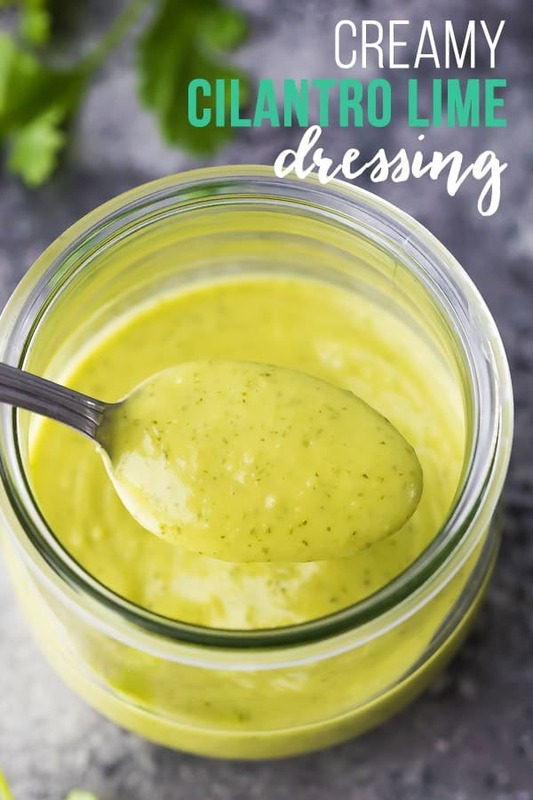 This might just be the salad dressing of my dreams…creamy, tangy, and full of fresh cilantro and lime flavors. This creamy cilantro lime dressing is modified from this Crock Pot Beer Chicken Taco Salad with Cilantro Lime Vinaigrette. Adding half an avocado totally transforms the cilantro lime vinaigrette into a creamy dreamy jar full of heaven. I could eat this stuff with a spoon! 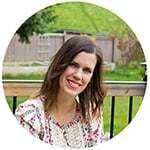 How to make cilantro lime dressing? Just combine the ingredients above (olive oil, white wine vinegar, honey, cilantro leaves, garlic, salt, dijon and lime juice) in the jar that comes with an immersion blender (I have this one! ), or use your blender. Blend until smooth. You can serve this as a cilantro lime vinaigrette (no avocado), or as a creamy cilantro lime dressing (by adding 1/2 a ripe avocado). 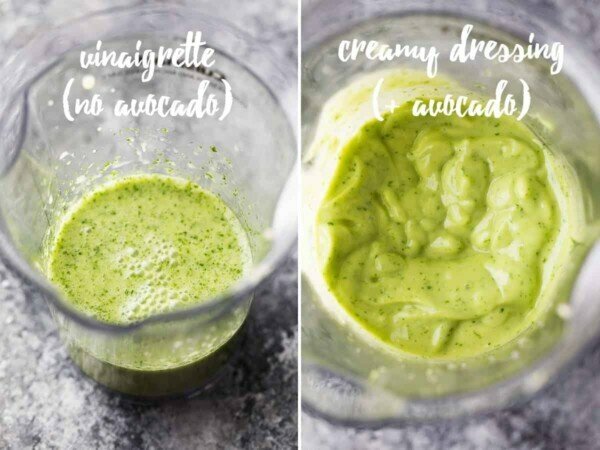 Either way, you are getting one seriously delicious and super tangy dressing. How long does this creamy cilantro lime dressing last? 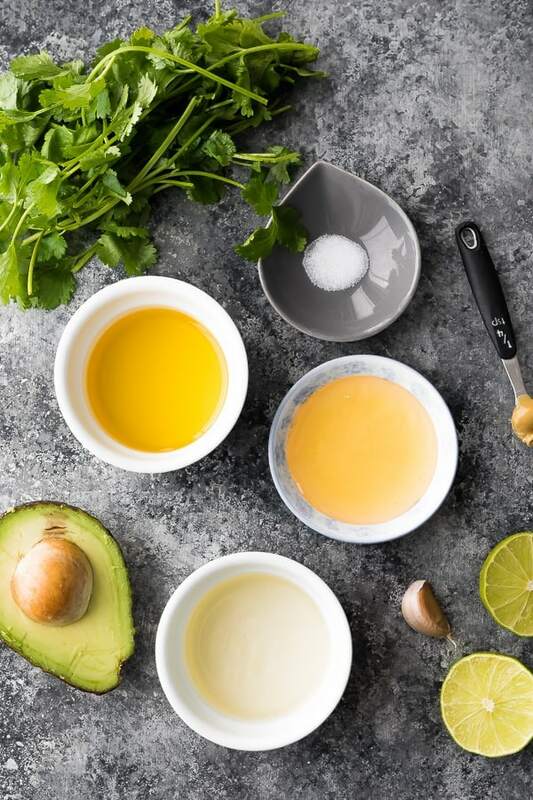 Normally avocados need to be consumed ASAP when they are ripe, but thanks to the vinegar and lime juice, this dressing is good in the fridge for up to 5 days! Make sure you mince the garlic, otherwise you may end up with chunks of raw garlic in your dressing. Yum! Not. 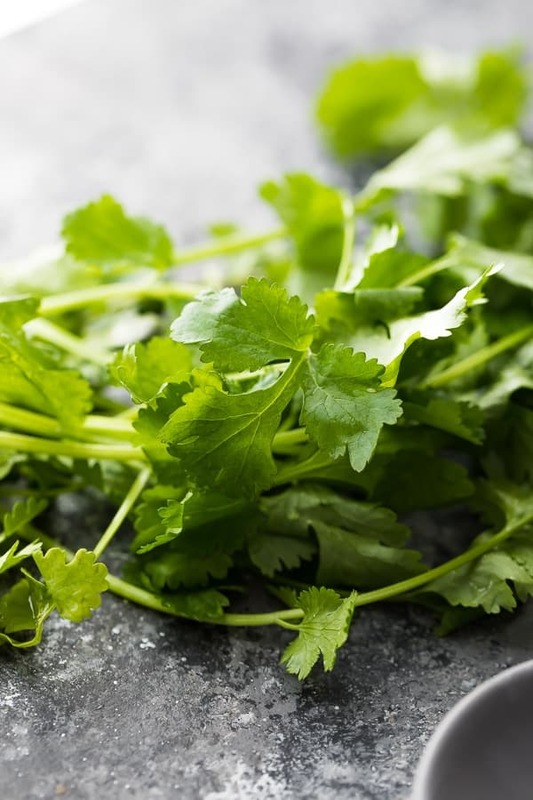 This recipe might be good on a salad topped with this Cilantro Lime Chicken! 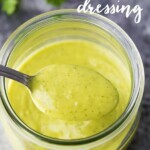 Looking for more salad dressings? 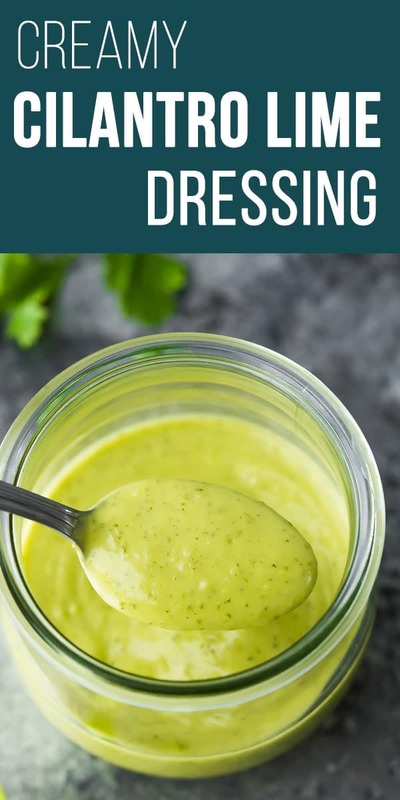 Try this Raspberry Basil Vinaigrette, this 4-Ingredient Balsamic Vinaigrette, or this White Wine Vinaigrette (which is my FAVORITE all purpose dressing)! Watch the video below to see exactly how I prepped my Creamy Cilantro Lime Dressing. It’s so easy! You can find more of my recipe videos on my YouTube channel, or on Facebook. Creamy cilantro lime dressing is perfect to jazz up your salad. Fresh cilantro, avocado, garlic and lime make this so much better than store-bought! Combine all ingredients in a bowl and blend with an immersion blender. If adding the avocado, you may wish to thin the dressing out with some water. Nutritional information includes the avocado. look so delicious ;x Your pictures are beauties! LOL! You are too funny. Thanks, Lindsay!